AIM: To celebrate women’s achievements in support of the press for progress 2018 International Women’s Day Campaign. ETHOS: To share stories of women whose achievements we admire, to cheerlead for women to inspire and promote confidence. We’d like the stories to champion all sorts of achievement from tiny to huge, with the aim of highlighting that sometimes even the little wins mean a lot. 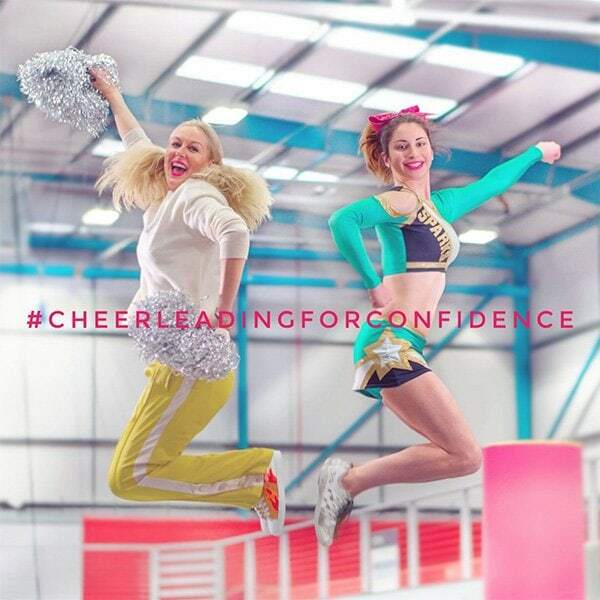 This is all about inspiring other women and creating confidence – it can give us a huge burst of often needed confidence to know someone’s got our back and is cheerleading us from the sidelines. Post a pic of the person you’re cheerleading for . Post a pic of yourself cheerleading for them. * see pic of Emma demonstrating the pose below. CAMPAIGN LAUNCH: 5th March onwards International Women’s Week. PLATFORMS: Instagram / Facebook / Blogs / Linked In. with the right outfit. Emma’s mission is to help woman feel confidence through their clothes, whatever their age, size or shape. well, work well, and feel good. Kate brings creative spark, magic, and a bit of rock n’ roll colour to her client’s lives.